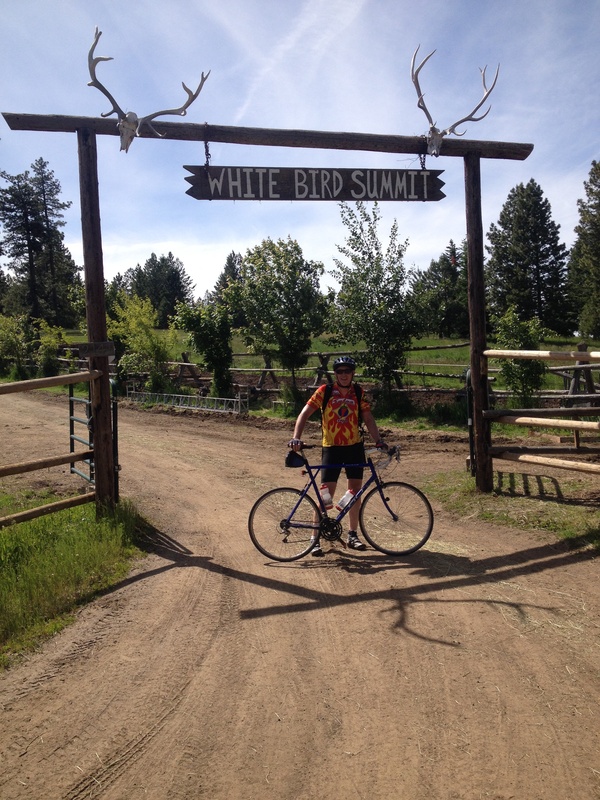 This is the final installment of the Bike Ride – a day-by-day log. To start from the beginning, go here. Today was a long ride. We had about 84 miles to cover. It looked like it was going to be a late start, so I took off after a big breakfast. I rarely eat a breakfast, but that meal has certainly been critical on this trip. The first 10 miles were great. The wind was at my back and the road was not terribly busy. I was tempted when leaving town to ride a rails to trails route that extended about 50 miles and would have avoided the road. However, most of the route is designed for mountain bikes and I would have had a tough time with skinny tires. At 10 miles I hit the first uphill and the wind switched to my face. It started warming up, so it felt like it was going to be a slog. But, for every uphill there is a downhill. Much of the first half of the day involved heading down Hell’s Canyon. This meant following alongside a river. The contrast between the water and the dry mountain sides is impressive. It gives you a real sense of the importance of water. The second half of the day was a real switch. Out of the desert and back into forest. Although we were nominally going downhill, it was windy and I had to pedal constantly. Robert had the best animal sighting today. A yearling black bear ran across the road in front of him. Several other people saw it happen and confirmed it. Therese sighted two badgers running across the road as quickly as their short legs could take them. As for me, all I spotted were deer and birds. I could argued that I am halfway to the north pole. 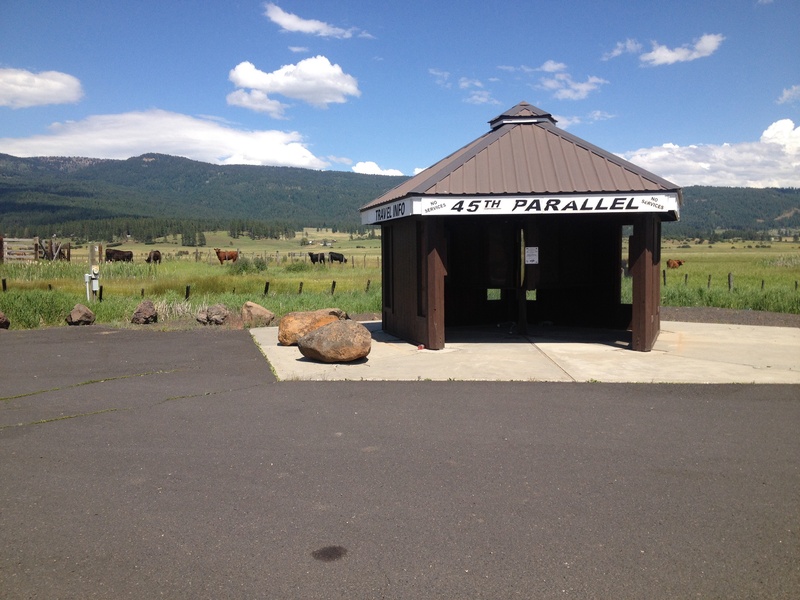 At one point I crossed the 45th parallel. Okay, I haven’t pedaled that far. We started by driving a bit past where we left off the day before. Little did we realize that salmon season was in full swing. Places along the river were jammed with cars and hopeful anglers. The ride looked promising with a long downhill with the river. At the end of the day we knew there would be a steep climb and then another long downhill. It was surprising how quickly we left the forest and ended back in high desert. There was plenty of water in the river bed, but grass and little else on the hillsides. Even so I find the scenery to be beautiful, quiet and deserted. We turned off the main highway to climb what was the old highway. This was on the Nez Perce reservation and the road went past an infamous battle site where the Nez Perce war started in 1877. The climb went on forever, up switchbacks and through scrub land. It was possible to look up and see the aray of switchbacks reaching into the sky. While daunting, this was the most spectacular part of the ride so far. Looking back down into the valley was thrilling. All of us commented on the same thing at the end of the day. Awe inspiring. Getting to the top of White Bird Summit was a relief. We stopped short that evening. I thought about continuing another 20 miles, but everyone else had enough riding for the day and we had gotten off to a bit of a late start. The next day was going to be extra long. Surprisingly in Grangeville, where we stayed, we had our best meal of the trip. A small restaurant in a small town with a very limited menu. Yet the food was excellent, prepared with care and would have fit well in the Houston restaurant scene. Stop by the Twisted Cellar if you ever get a chance. Bradon and I left early. We hoped to ride the 108 miles to our next stop. The first 40 miles looked to be easy and was mostly downhill. However, following that it was steadily uphill and there were no services for the remaining miles. We would definitely need support. The plan was to meet at mile 48 to get fresh water and lunch. The ride out of town was stunning. We rode through fields of mustard, wheat, barley and oats. All of this was through a rolling countryside. It was mainly heading downhill. After 15 miles, we suddenly faced a steep descent through switchbacks, loose gravel and hairpin turns. 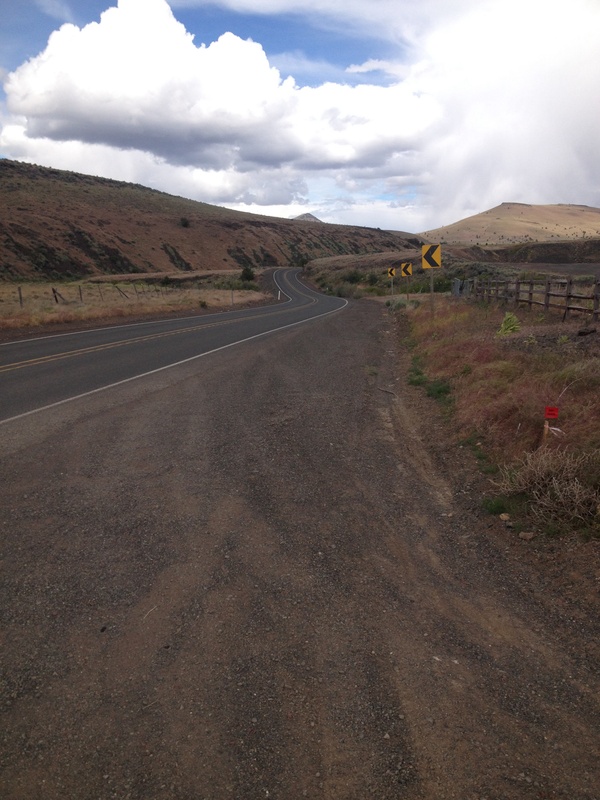 Of course, I hit the fastest speed for the entire ride on this stretch – just under 50 mph. Exciting and a bit frightening at the same time. Later I learned that Joe had tried to ride his disk brakes all the way down and they started to freeze up on him. Therese had to pick him up and ferry him down the remaider of the climb. Therese also came upon a biker who had overlapped with us for several days. He was fully loaded, carrying all his own gear. He was heading from Portland, Oregon to Portland, Maine. He stopped and was walking down with his bike because of the steepness and weight. Therese gave him a ride to the bottom. I pushed on and rode to the meeting place. The ride was on a pretty narrow road, but uneventful. This stretch of the highway is usually filled with large trucks, but today was Sunday so it was relatively quiet. I waited for quite a while before Bradon joined me. He had stopped in a prior town for coffee. I was at the point where there were no further services and waited over two and a half hours. We were both worried that something had happened, especially with the steep descent. It turns out that the rest of the group had gotten off to a late start. It was very frustrating not knowing what was going on. Cell service is nonexistant in most of this part of the country. It has even been rare to have a WiFi connection most of the time where we have spent the night. Ughh, sounds like a “first world” problem. I ran out of time to make the full 108 miles. I stopped after 87 as it was starting to get late. It was also getting difficult. The route was getting steeper going uphill and the road was increasing rough. Bradon and I both caught the sag wagon and joined the rest of the group, who had driven ahead, at the Lochsa Lodge. 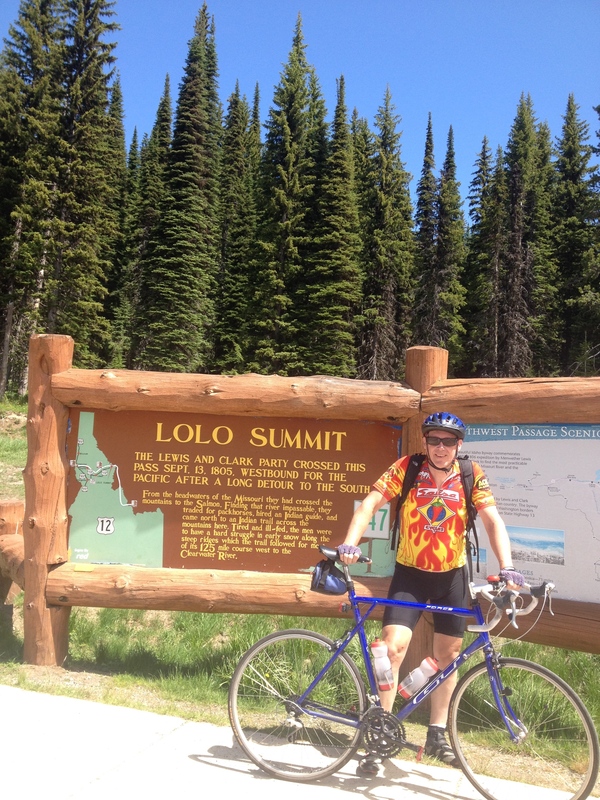 Tomorrow is the ascent over Lolo pass. All along the route we have been told that it will be very difficult. I’ve ridden it once before and did not recall it being that tough. But, I was younger then. An early start to get over Lolo pass. 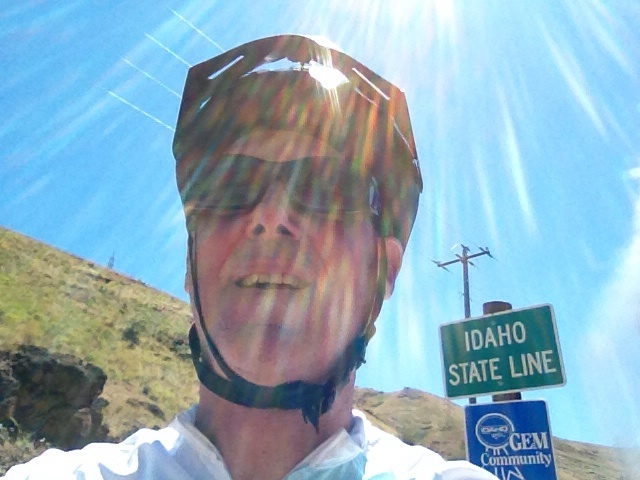 Only 14 miles to the top and then it looks like a gradual downhill from there into Missoula. Only 60 miles to ride and it should be a breeze. The pass was difficult, but not bad. We’ve ridden worse passes on this trip. Perhaps it is because all of us are stronger than when we started. 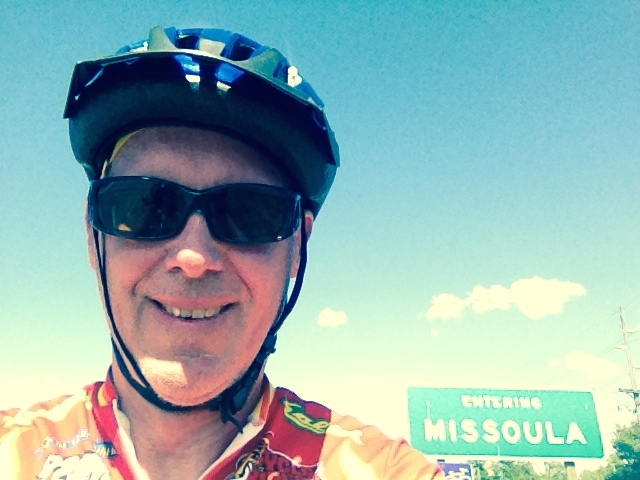 Wonderful to get on top and be at the Montana border. It almost makes me wish I had a few more states left to ride through. We waited at the top for everyone to show up so we could get a group photo. It was nice to see that we all could make it this far. Coming down the pass was great, but the steep downhill did not last long enough. After just four miles we had a slow, steady grade downhill following a creek. 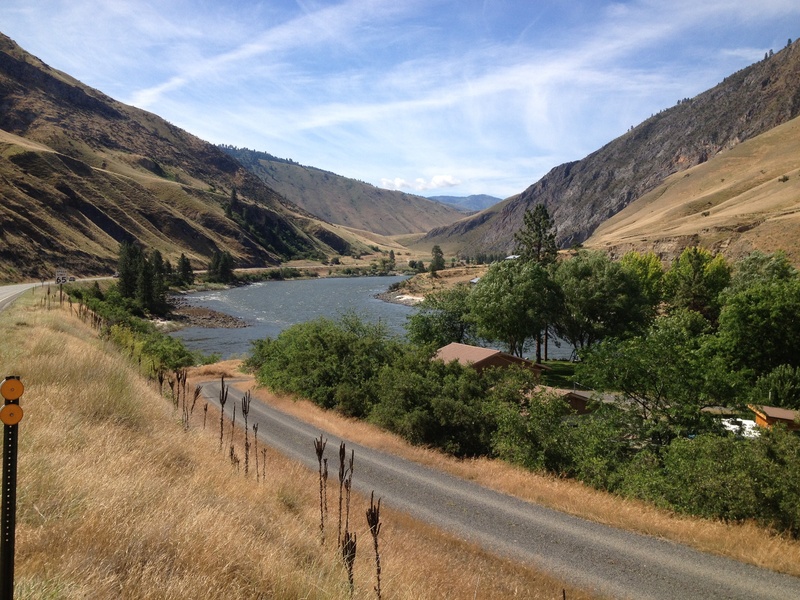 Native Americans had called this creek “no salmon.” On the other side of the pass the river was called “has salmon.” It is an important difference. Naturally, the wind picked up and was in my face. It is a bit frustrating knowig you are riding downhill, yet having to pedal hard to keep moving. 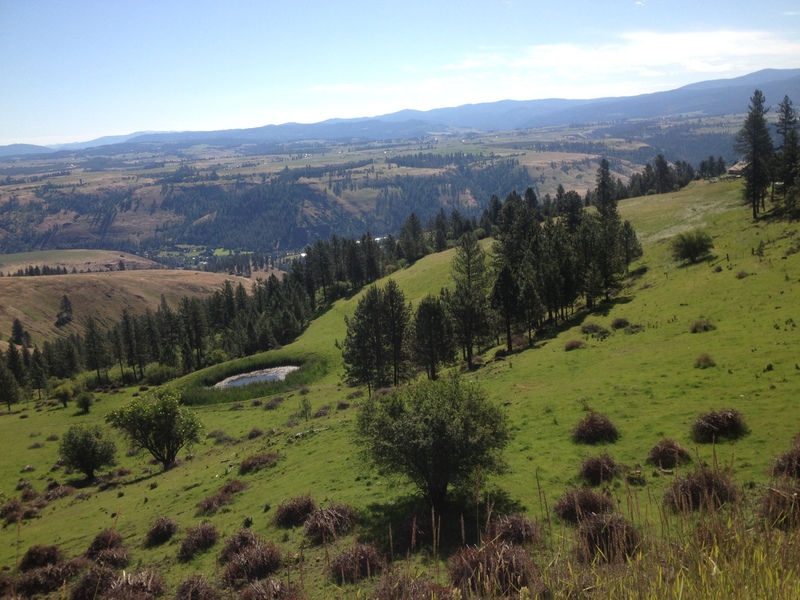 It was disheartening to get closer to Missoula. Increasingly along the road there were cabins anf homes. Signs of civilization, but detracting from all the beauty I had experienced for the past 11 days. We all made it, though there were two flats today. I have been fortunate. No flats over the 645 miles that I rode. It has been fun. Next time I would like a longer ride. The continuing saga of play. I was much improved following a day off, icing my tendon and taking aspirin. This meant that I got to ride today! Of course at the outset I wasn’t sure that I wanted to. It was in the 40s and raining at the outset. However, the promise was that the rain would let up and the sun would start peeking. It was a short distance day. We started off with a great breakfast in Baker City. The place was a refuge of old hippies, with vinyl records and an old fashioned stereo system (the same model tuner/amp that I used to own, so it was an antique). However, it was still raining and cold. It didn’t matter because we all suited up and headed out. First stop for me was a Forest Service museum concerning the Oregon trail. After hearing about their hardships, I decided to stop complaining. They were happy to cover 10-15 miles per day. I expect to do that in less than an hour. My roads are in a lot better shape than theirs. The museum was sited on top of a hill overlooking the valley. It meant I had a one mile steep ride – probably the steepest of the entire trip. The trip was worth it and I won’t complain. Most of the afternoon was downhill. 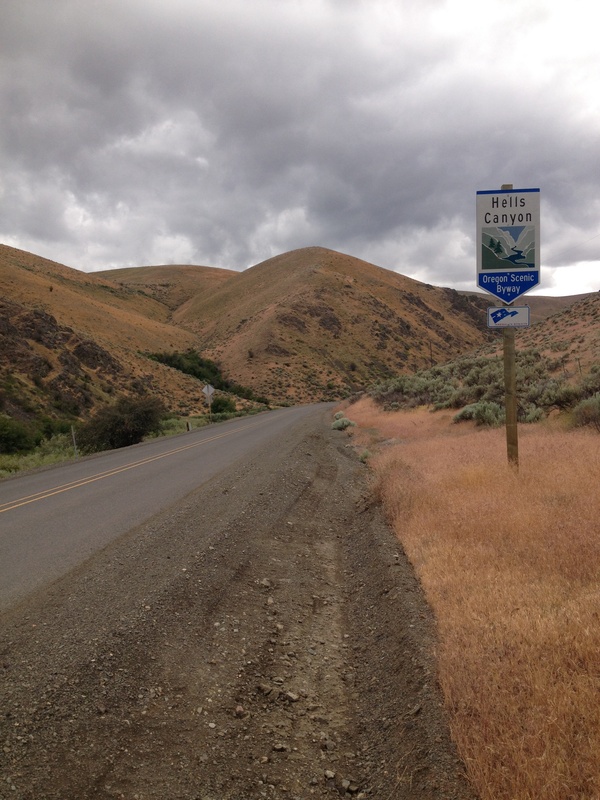 We were following Hell’s Canyon. This is the really dry side of Oregon. Little grows except right near the river bed. The canyon walls are very steep in places. But, by traveling downstream, it meant losing altitude. It seemed more like Heck’s Canyon because it was cool, overcast and downhill. We paid the price for all the downhill. The last segment of the day was up the side of a mountain. Robert and Gigi opted out of the full climb. Gigi’s knee has been bothering her. Both Joe and Bradon took it on. They finished before I did and we agreed that it was a pretty difficult climb. It only lasted 5 miles, but it was a very slow ride. The worst part is that you can see the road miles ahead of you. I prefer something forested when I can only see the road several hundred feet ahead of me. That way I can fool myself that the climb isn’t all that bad. After cresting the summit it was no time into town. We had a wonderful little place to stay in Halfway, Oregon. The Pine Valley Lodge is very quirky. The rooms are all different and there is plenty of outdoor space to sit around. Several of us shared a bottle of wine to celebrate the end of the day’s ride (and I iced my tendon). It even warmed up a bit, but the sun made only a brief appearance. It shined on me for two minutes when I reached the summit. Sunshine! We haven’t seen sunshine since we started this trip. My tendon felt very good, so I was ready to ride. I think that all of us would have loved to spend an extra day at the B&B. But, it was time to move on. Once again we faced a long downhill ride, still in Hell’s Canyon. We have been warned that later in the day we’ll be hitting another pass that will be worse than yesterday’s. It looks worse on the elevation map. Joe was worn out from yesterday’s ride, so the rest of us headed out. The downhill continued to be amazing. Today it was perfectly calm all morning. It made riding very nice, especially with the sun. All my cold weather gear is packed away and I hope not to have to use it for the rest of the trip. Ughhh. The pass was tough. A very long ride uphill that seemed to have no end. It was hot and there was little shade. Even so the ride was pretty and we were rewarded with a fast downhill. Therese and I grabbed a few beers and I soaked my ankles in the swimming pool. It wasn’t heated, so that made it better than an ice pack. 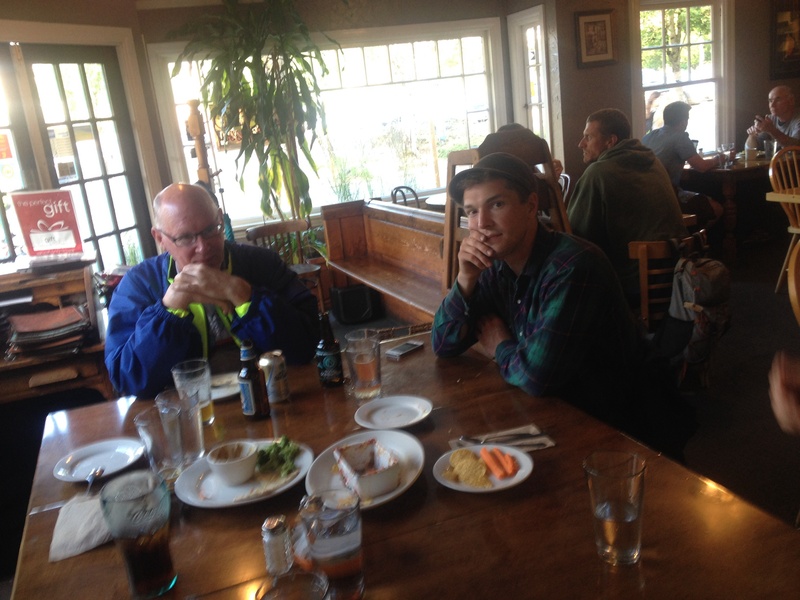 Afterward, in Cambridge, ID we ate gourmet hot dogs at a very quirky place. The town only has 380 people, and this gourmet dog place was struggling. However, it was enormous fun and eating outdoors on a deck was a treat. No mosquitoes so far. A nice end to a sunshine filled day. Partly cloudy this morning, but plenty of sunshine. We got off to a late start, but we did not have a light day ahead of us. I took off as quickly as possible. The first part pf the ride was through a long valley. When I started the wind was at my back. But by mile 11 it switched to blowing in my face. This was okay, except it happened with the first of the uphills. Today there was a long climb, but slow and in stages. It was warm enough to ride without jackets and riding into the wind kept me warmed up. Early on in the ride I spent some time in a local town museum. For whatever reason, I love these places. They often have a strange mix of whatever was donated. You can never tell what you’ll find. In this case it was a dentist’s office run by a female dentist who had gotten her schooling in 1912. Apparently she was much beloved and feared by the folks in the town. Quite the amazing story of a woman who fought against the tide. Robert had the best wildlife sighting today. 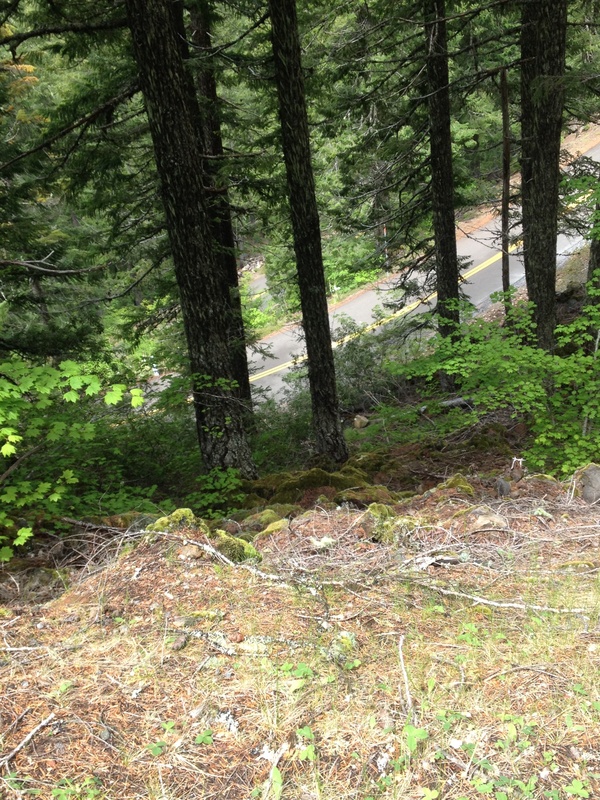 As he was coming downhill, he watch a year-old black bear cross the road about 80 feet in front of him. I haven’t seen that kind of wildlife so far. 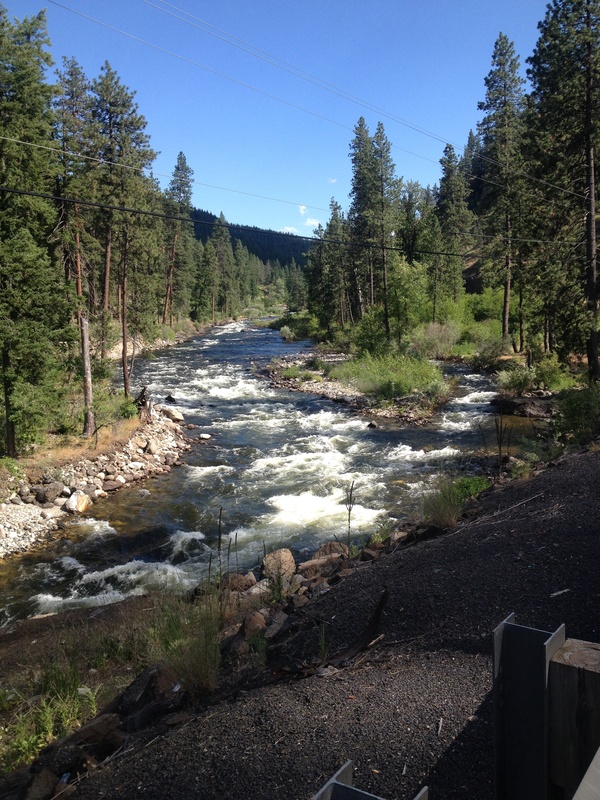 The remainder of the afternoon and early evening was a downhill ride along the Little Salmon river. Again we were back into fir trees. The river was flowing pretty well and was loud. Unfortunately the road was narrow and busy with traffic. Worse, the wind was really strong. I spent all of my time pedaling to keep going downhill. It wasretty demoralizing after 26 miles. At the end of the day we met up with Nancy, who is Therese and Robert’s sister. She wanted to join us on the last part of the ride and will be a welcome addition. Dinner was over many beers brewed in McCall, ID. Many stories we told about the siblings. At then end of the meal it was clear that everyone was tired. A longer day tomorrow looms. Yet another steep climb. This entry was posted in Uncategorized on June 22, 2014 by rkwrice. I advocate balancing work and play. However, I have never been very good about it. Most academics are terrible at striking the balance. This mostly has to do with the fact that we are our own small businesses, we overcommit and we infrequently find extended blocks of time in which we can think hard about our research. When we do have such time (weekends or short holidays) we tend to devote it to work. I know that I often do this. When I stepped down as Editor of AJPS I decided I would do something to force me to play. I was certainly burned out. The journal was a full time job and I continued to teach and try to carry out my own research. I needed to clear my mind. What better way than to take a long bike ride? I may be trying to recapture my youth. 16 years ago I rode my bike across the US and I had a ball. It was an amazing trip and was a fabulous way to see the country. I went with a very large group as part of a fundraiser for the American Lung Association. It seemed like a deluxe trip. A truck carried my gear from llace to place. Meals were prepared along the way. All I had to do was ride, pitch my tent, sleep and repeat. This time I’m scaling back. 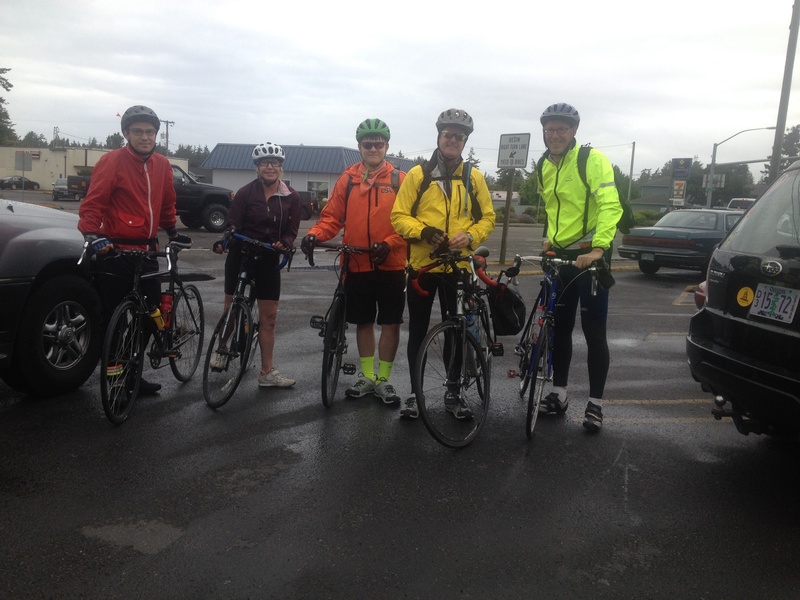 Five of us are riding together from Florence, Oregon to Missoula, Montana. We thought about a cross country trip, but the logistics got complicated. We’ll do the cross country trip next year (at least I will). This scaled back ride will take 11 days and will take us through some lovely scenery. It has been a very long time since I have taken this much time off. I won’t be thinking about work. I will be letting my head clear. Perhaps I’ll feel recharged (or more likely worn out). The point is to strike some balance. I am not advocating that everyone go out and jump on a bike and ride 90 miles a day. Instead I hope that the message is to take some time off from your work. Do something you enjoy that is unrelated to your work. You are likely to come back to your work refreshed. We’ll see what it does for me. I am going to add to this post each day to chronicle the ride. It won’t be terribly academic, but it will mean I can spend some time each day writing. It won’t be work – just fun. 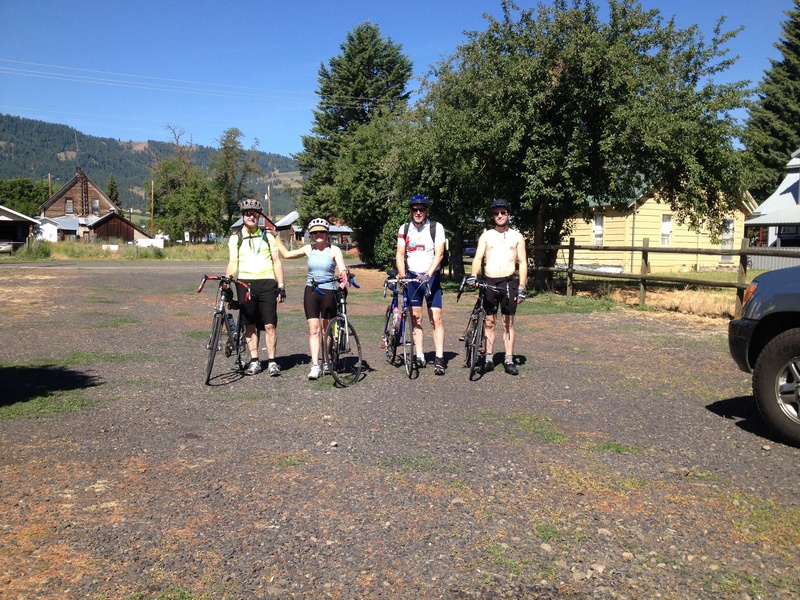 The ride was from Florence to Eugene, Oregon – approximately 80 miles. The group included Therese, my wife, who volunteered to drive the “sag” wagon. Her job was the most important. She set up regular stops where the riders would have food and water. Robert, Therese’s brother is part of the riding group. 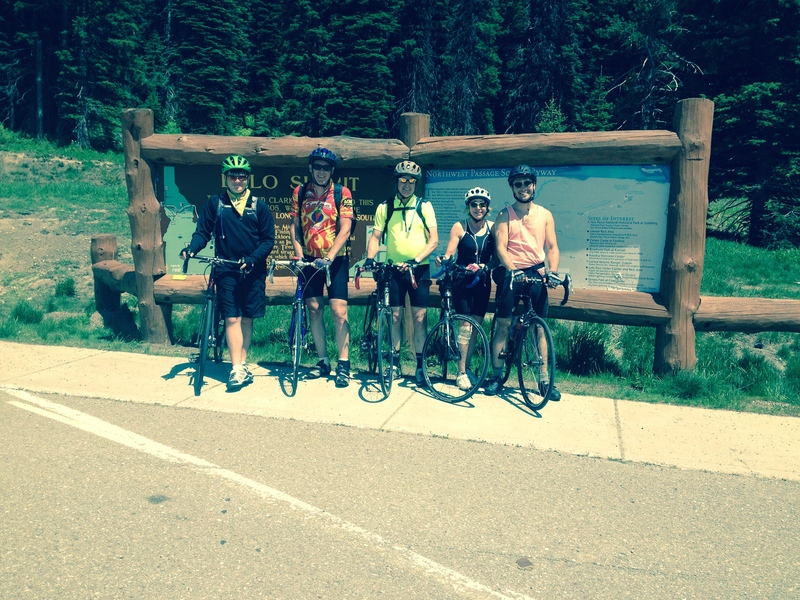 His sons, Bradon and Joe, also are riding. The last of the group is Gigi, Robert’s partner. None of the others have ever ridden long distance before. I’ve done a number of long rides, including across the US. However, I used to be a lot younger. Florence is on the Pacific coast and if this was a cross country ride I suppose I would have dipped my wheel in the Pacific. There was no need on this ride and we were all anxious to get started. It started raining the previous day and looked threatening as we left. The first 10 miles were on a busy highway with large shoulders. The shoulders made riding easy even with the traffic. The route followed a river and was lined with hills filled with large firs. We turned off the main highway onto a much smaller and less traveled road. The shoulders were minimal, but so was the traffic. I love riding back roads. Here the scenery was spectacular. Being from Houston I’m used to trees. But here the trees were huge and covered in moss. Of course the rain dampened things a bit. However, the rain was light and not constant. Riding and rain when it is cold is my nightmare. This wasn’t so bad. A most amazing part of the ride was on a bike path coming into Eugene. The path cuts through a wildlife area that supports a ton of birds. No surprise that Eugene, the Austin of Oregon, is supporting both biking and wildlife. The path seems to be used a lot by both the feathered and the legged. Of course, on the bike path Gigi got the first flat of the ride. Up to this point we all had been fortunate. The end of the day finished with beers. Of course there are an amazing number of local beers. I tried as many as I could. Off to a late start this morning. But we had a light day – only 60 miles. It was a good idea because tomorrow we have a very difficult ride. I hate riding in strange cities. Eugene is hardly a big city. Nonetheless, getting out of town was a lot more difficult thna getting into it. I have a great mapset for biking that I bought from TransAmerica. Even so, it was a pain. Once out of town the scenery was again great and the route that we took is widely used by a lot of the area cyclists. Consequently there were plenty of bikes on the road and few cars. It was a great time for quiet – just the spin of tires on the road. Again it was overcast, but at least there was no rain. Lunch was where the first water break was going to be. We were off to a late start, which was fine given that we only had 60 miles to cover. Robert and Gigi arrived fairly late. Robert had the second flat of the trip and it turned out that his pump didn’t work. He had to wait for another cyclist to bail him out. The remainder of the afternoon began on a very busy stretch of road. At least the shoulder was wide. Eventually the traffic thinned a bit. As it did the trees along the road seemed to grow in height. 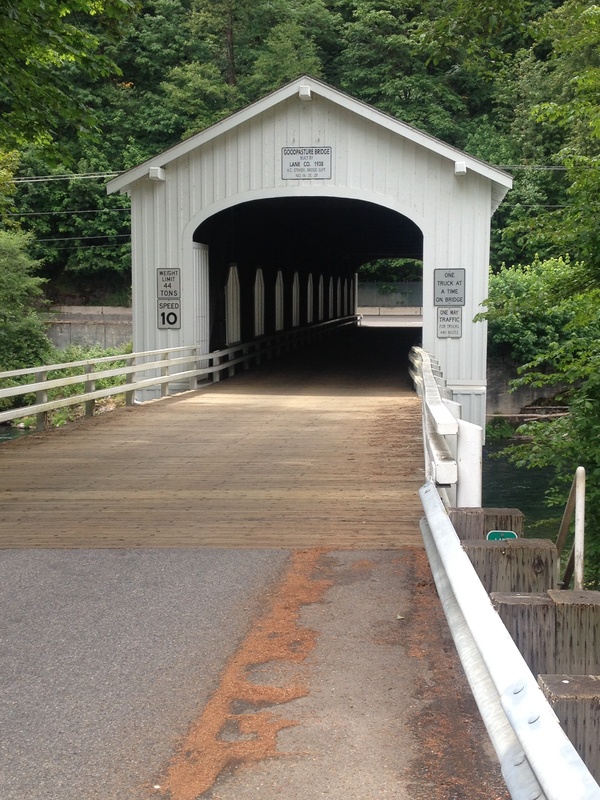 Who knew that Oregon has an abundance of covered bridges. These were mainly built in the 1930s and they were all along the route. I found that I kept stopping to play sightseer. The last stop of the day was McKenzie Bridge. It is nothing more than a general store. Lots of people biking were stopped there, enjoying a beer. Since it was the end of the day, I was happy to join them. By the end of the day everyone was worn out. Part of this had to do with the difficult ride the day before. We were down to two riders today – me and Bradon. 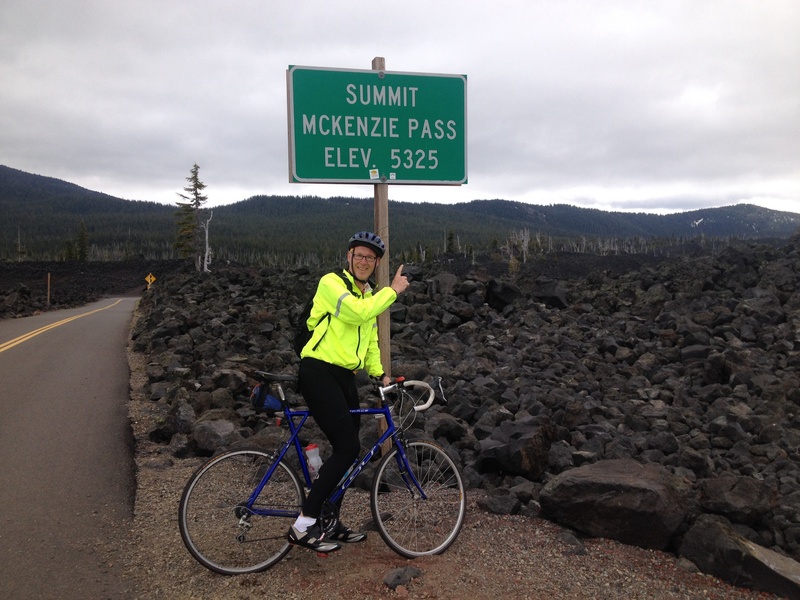 The morning was given over to a 22 mile, 4000 foot climb over McKenzie Pass. The road is closed all winter and is very narrow. When the snow is cleared, the road is open to bicycles. It was out lucky day. Tomorrow, June 16, the road will be opened to cars. Today we had the road to ourselves. What a great climb! Very difficult betwen miles 5 and 18. However, riding switchbacks through giant firs is not bad. The rain held off and there were a lot of cyclists on the road. My favorite was the guy with his two-year-old son being towed in a trailer. Dad said it was his father’s day gift – a chance to spend time with his son. He looked like he was having fun on his way down. I had plenty of layers of clothes and was glad I brought them. It was very cold on top the summit and really windy. I didn’t dally up top. Of course the best part is having a 15 mile downhill ride. The rest of the group met us about 6 miles down the side of the mountain where the snowgate remained closed to autos. Lunch and plenty of water, then back downhill. The rest of the group headed off to run errands and I pushed on another 35 miles. 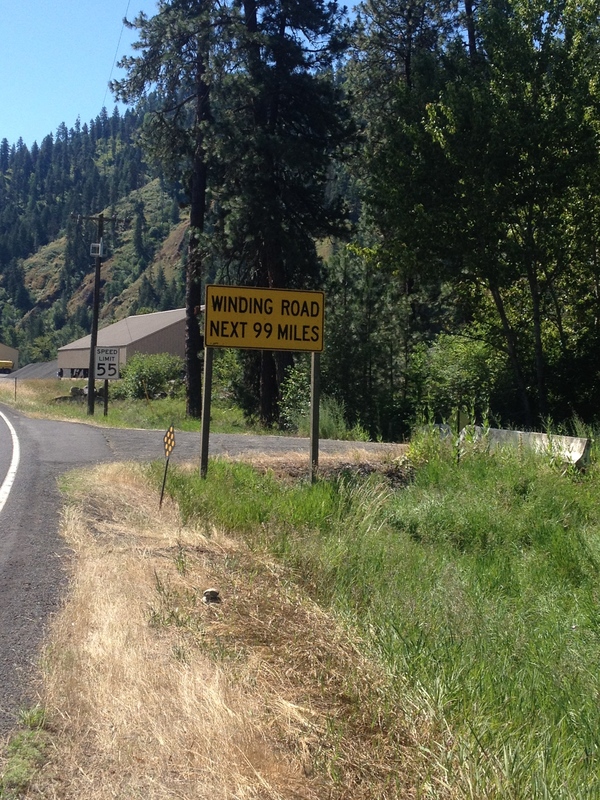 Once down out of the mountains I road along a fairly level road, with a very strong tailwind. The area was much dryer and more agriculutral. I bailed on riding the remaining 10 miles as my achilles tendon was starting to bother me. I found a great brewpub and settled in with a Cyclops One Eye P A. Delicious! Ouch. My achillies tendon is a problem. Right from the start of the ride it was painful. 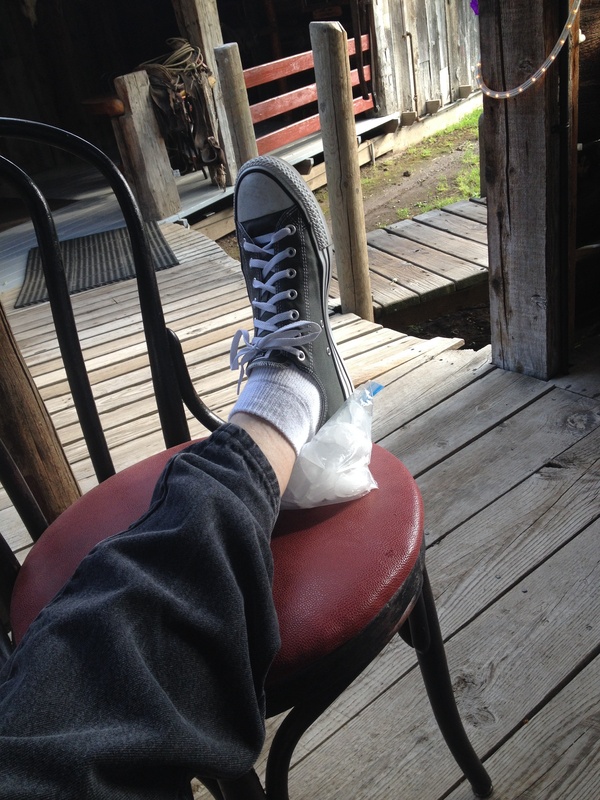 Therese, the ever faithful sag wagon driver, grabbed an ankle bandage and that helped. I managed the first 20 miles which wound up into the mountains. We were back into large firs and I couldn’t resist the scenery. However, the tendon was hurting enough by mile 20 that I rode for a while. Sadly I rode to the top of a pass and got out to pedal the downhill. What a whimp. The first downhill was great, but I had not earned it. It was a 10 mile downhill with about a 1500 foot descent. A lot of fun, but very windy and so I only hit around 42 mph. We stopped for lunch in a delightful little town, Mitchell, and chatted with a number of very talkative locals. They get a lot of bicyclists through and we were made veey welcome. I kept riding, deciding I had better earn my next downhill. This was a slog – 6 miles of steady uphill. I don’t mind riding uphill. What I do mind is constantly seeing the steady grade miles ahead of you. On this side of the mountains it is more like high desert with few trees. There is nothing to block your vision, especially as the highway stretches on seemingly for miles and miles. Climbs are almost always rewarded with downhills. I continued for another 20 miles, downhill, in about 50 minutes. I had a strong tailwind to push me along. This area was gorgeous in a high desert way. Not much traffic and very few dwellings. But, I had to call it quits. I didn’t want to do any damage to my tendon and my knee was starting to hurt. This new problem was probably due to compensating for my tendon. Sheesh. It is tough to get old. I wish I had finished the ride for the day. It continued downhill for many more miles and ended up coming through a very narrow gorge near part of the John Day fossil beds. The geology in this area is striking. Ughhh. I’m not riding today. My knee was feeling horrible last night, but better today. My achillies tendon is not much better. We all decided on a short day today and Robert, Gigi and Bradon are riding. It is overcast and cold with rain off and on. I would rather be riding, but I think it is smart to hold off. It has been smart. I’m feeling better and I’ll be able to ride tomorrow. It helped that I had a Barley Brown WFO IPA. Wonderful beer brewed in Baker City. This entry was posted in Uncategorized on June 12, 2014 by rkwrice. In one of my last posts I put together advice to junior faculty. That advice was largely cobbled together from other people’s postings. Here I thought I would do the same thing, only with a focus on Graduate students. Whatever advice I have to offer obviously comes from the perspective of a faculty member – not as a graduate student. This advice has more to do with expectations on the part of faculty (or at least this faculty member). I gloss over, ignore or am ignorant of a lot of problems facing graduate students. Advice from your peers is plentiful on the Web. For aspiring undergraduate students considering graduate school, you might want to read the advice offered by Justin Esarey on The Political Methodologist. Likewise, the ever present Chris Blattman offers very useful advice that should be consulted. Becoming a graduate student is a lot like joining a Guild. You will be apprenticing yourself for a long period of time. These days this is something that someone shouldn’t do lightly (or treat as a default option because no job was forthcoming). Alternative sources of general advice include Stephen C. Stearns and Ronald T. Azuma. While these are a bit old, they are still worth the look and, as a plus, entertaining. A more recent perspective on professionalization can be found here and here . Your job. As a graduate student you have one main job. Learn to be the best scientist you can. I know that there are demands for grading, being a research assistant and teaching. But all of those are secondary to your primary task, which is to learn how to be a scientist. As an apprentice you will be expected to watch faculty, ask questions about what they are doing, bring up new and interesting studies that you have stumbled across and learn the tools necessary to join the Guild. Pick your advisor wisely. Sometimes the seemingly slow pace will frustrate you. Other things will compete for your time. Just don’t lose sight of your goal. Work. Do your work and do it on time. I am amazed that “incompletes” are given to graduate students. If you can’t get your work done in the time allotted, you need to think about why that is the case. You may be cultivating a life-long habit of procrastination (which is a bad habit). You may be trying to do far more than can be done and/or was intended. A graduate research paper is designed to train you in how to carry out research. None of us expect that it will become a publication. You shouldn’t either. Don’t take incompletes. As Barry Weingast (then an Assistant Professor) once told me “Dean’s don’t give incompletes.” Incompletes are not a good habit to cultivate in graduate school and is certain death when you get a job. Read. You will spend a lot of time reading, so learn to read smart. Do you really have to memorize the coefficient size for the third variable on Table 4? It would make more sense to understand the point behind Table 4 and whether it is critical to the argument. Why not start by reading the introduction and conclusion? What is the main contribution and how does it fit with the literature? Do this before you plow into the article. You will be reading a good deal of technical material that will be very taxing in terms of time and energy. Don’t let it wear you down. Take the time to read broadly and generally – preferably material that is not required on the syllabus. You never know where you are going to find inspiration, so don’t be afraid to read outside your field (or even outside your discipline). Read fiction sometimes. it might help you with the next point. Write. Writing is like learning a new language. If you don’t practice it, you’ll lose it. It takes practice and to get good at it you have to do it routinely. You should be able to write 1000 words of reasonable prose each day. Blogging might be a good place to practice (I know, some faculty regard it as a waste of time – but I think of it as honing your communication skills). Re-writing is just as important as writing. Your prose can always be improved. I rarely write anything for publication that doesn’t go through 10 or more drafts. Read and re-read a good book on writing (I am partial to Helen Sword’s book). Publish. I won’t kid myself and claim that publications don’t matter when going onto the job market. They will. However, it is unlikely that all of your seminar papers will be ready for publication. You are better off joining with a faculty member and learning how to write a research article. If you think that one of your solo papers is ready to be sent off to a journal, please ask a faculty member to give it a quick read – offer to buy him/her coffee when it is read and you’ll find that you will be able to get 15 minutes of quality advice. As well, ask where the manuscript should be sent (although you should already have a good idea of where you intend to send it). If the faculty member gives a thumbs up, great. If not, you should decide whether to keep working on the piece or move ahead with further training and learning. While your first inclination may be to send the manuscript to AJPS, think twice (see my advice here). Rumors. You’ll never have so much spare time as you do in graduate school. This may seem impossible, but it is true. Having spare time means that you spend plenty of time with your peers. This can be good in that you learn from one another about many new tricks in the discipline. But at the same time close proximity to your peers can lead to the usual human sport: gossip. While gossip is not a bad thing (it helps enforce norms), most graduate student gossip focuses on faculty. Most of it is widely incorrect. I do not think about you and your research projects every hour of every day. I have plenty of my own work to do and that gets the lion’s share of my attention. Reading my intentions for an off-handed comment (or worse, your peer’s reading of my intentions) will be great for the rumor mill, but not so good for getting at the truth. If you have a question, why not go to the source and ask? I have no problem with students asking me questions about their career or work. I don’t, however, have time for idle chitchat or gossip. Time. It doesn’t matter if you work 80 hours a week. What matters is whether you finish your work. My guess is that your 80 hours of work was probably inefficient. How much time was spent on social media? How much time checking your email? How much time was spent re-reading the same paragraph because you are exhausted? As an apprentice to the Academy you should learn that you are in charge of your own time. Now is a good time to develop efficient work habits. It is also important to leave yourself time for yourself. Graduate school does the best it can to stamp out individual creativity. However, you should reserve time for creativity. It will clear your mind and make you much more efficient. Being creative may involve playing a musical instrument, making art, reading fiction, biking, etc. Go have some fun! Career. What do you want to do when you grow up? Obviously you want to get an advanced degree, but to what end? You might want to go outside the academy. That can be an excellent choice with some very good payoffs. You might decide that you really enjoy teaching and want to go to a small liberal arts college. Don’t be put off by your peers who are going to rate you by whether you are “serious” and looking for a faculty position at R1 institutions. People differ in terms of their interests and their relative skills sets. Understand what you want to do early on and prepare yourself while still a student. If you want to go into a think tank, seek advice for the best set of tools that will allow you to be a success. Ignore your peers who might look down at you for not going to an R1. They probably won’t be going either and you’ll no doubt be happier. Dissertation. There’s only one kind of dissertation: finished. While graduate school may seem interminable, make use of it. Again, I see it as learning the norms, the skills and the knowledge to join the Guild. Good luck. This entry was posted in Uncategorized and tagged dissertation, Graduate student advice, procrastination, work habits on June 10, 2014 by rkwrice.